I haven’t run the Bracknell half marathon for two years as it has been too close to London marathon, which I ran in 2016 and 2017. 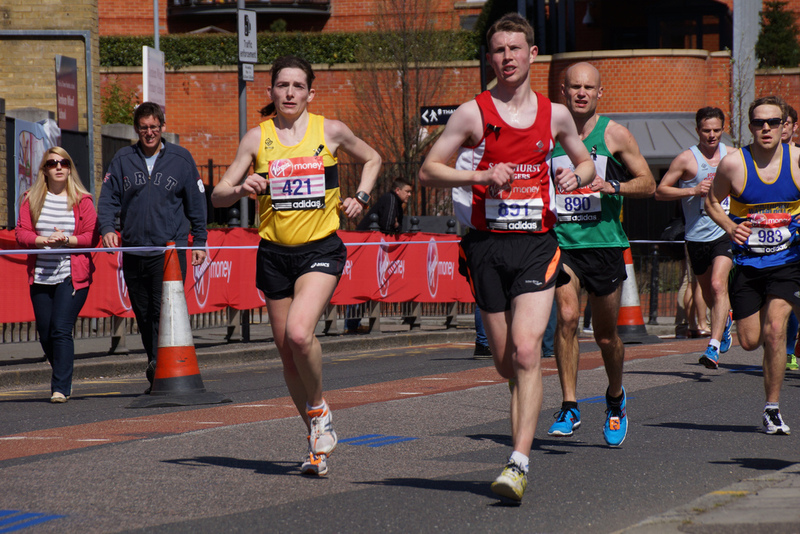 This year, I didn’t run London so Bracknell was back on the cards! Having had knee trouble and time off from running, I had got my distance back but not the fitness, stamina or speed that I used to have. However I decided that I would just have a nice time and enjoy the run. On Tuesday I did a hill session with the club which went well and left me thinking that maybe I was fitter than I thought I was! After a bad nights sleep (weird dream about being late to the race and not being able to find any parking, while the race started and everyone ran past my car – I never normally dream about anything!) I was up and about in plenty of time. I’d prepared my kit and packed my bag the night before so I set off, arrived and parked with no hint of my dream becoming reality. I found the start of the race and met up with a few other SJ’s. I’m always surprised how few Sandhurst Joggers run this race considering how local it is. It’s not the prettiest route but it’s challenging and not too expensive. We discovered that the baggage tent was unmanned for the duration of the race so I decided to leave my bag in my car instead so headed back to the car park. En route to the car park I realised I’d forgotten to attach my timing chip to my shoe! I guess I’ve become too used to the ones that are on the back of the number. Returning to the race start, I decided to run with Charlie who was pacing Blanche for a sub 2 hour run. However I quickly lost them in the crowd so lined up and set off by myself. The race started in the middle of town and the thousand or so runners streaming through the town was quite a sight to see. However the route was quite narrow for a while as we came out of town onto a duel carriageway where we only had use of the pavement, the runners had not really separated out enough for this and there were too many of us on the path. This made it a bit of a slow start and people kept trying to run on the road which was not safe. Bracknell is quite a tough course. There are some sharp turns into and out of underpasses and lots of hills. I fell into step with a guy whose name I didn’t get round to asking and we ran together for a few miles which was nice as I’d lost my friends at the start. I lost my new friend at about six miles and consoled myself with a jelly baby which I’d stashed in my waist belt in case I had a need for one. I caught up with Charlie and Blanche at about 8 miles. We had a brief chat and then I pushed on. More hills, more underpasses and I caught up with Royston at about mile ten. He wasn’t having a good race which is the only reason I ever catch up with him! At 11 miles I decided another jelly baby was needed. The jelly baby had other ideas though and caused me a bit of nausea which I don’t usually get when running. The final two miles were just about pushing through and keeping going. The finish brought us into the town again where a huge crowd had gathered. The roof of the Lexicon amplified the cheers of the crowd which really made me feel like a celebrity as I crossed the line! We got goodie bags, technical shirts and water after the finish and then after collecting my bag, I met up with a few others in my favourite coffee shop for a hot chocolate before heading home for a shower and a sleep!